Highlight, enhance & toughen the look of your Dodge SRT-4's Fog Lamp areas with these unique Fade decals. Available in one (1) of three (3) fade colors, our kit is provided with one (1) decal for each Fog Lamp area. As an extra step, decal graphic pieces are over-laminated with a 2.5 mil clear laminate which will protect the graphics from miles of abuse. Decals are precut and very easy to install. 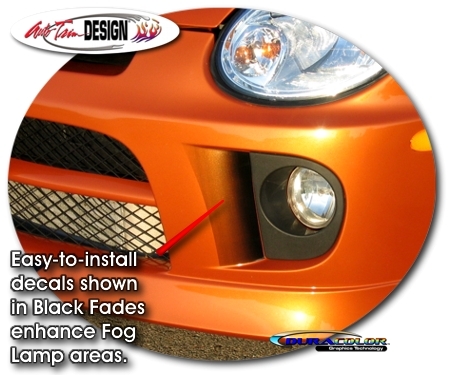 This kit will fit any '03-'05 Dodge SRT-4 with Fog Lamp areas as shown in image. General online application and care instructions are included.